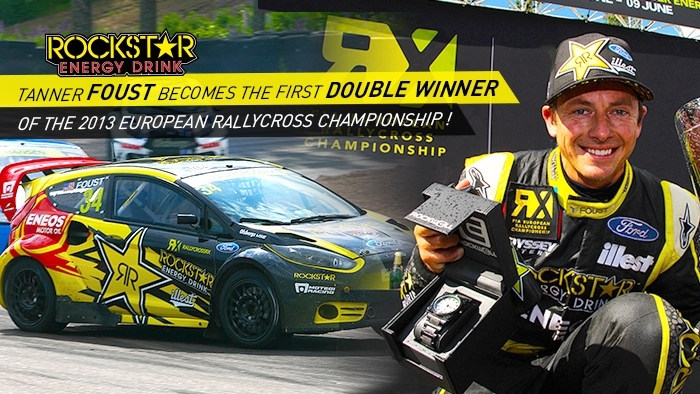 OUVOLA, Finland (June 10, 2013) -- Tanner Foust earned another European Rallyross Championship win this weekend in Finland, to make it two victories in two championship starts this year. It was a come-from-behind performance for Foust, who started the Rockstar Energy Drink Ford Fiesta ST on the back row in the SuperCars final but fought through the pack to take the lead late in the race and hold it to the checkered flag. "From the back row it's just chaos," said Foust, who moved from sixth to third as rival drivers clashed through the dusty first corner, then claimed the lead when car trouble sidelined race leader Petter Solberg. "Having been on the bad side of the luck fence this year I don't take my good fortune for granted. There was a little bit of luck on my side and I was in the right place at the right time." The Finnish race favors Foust's aggressive and controlled style and is a particular favorite for the driver. The track features hard landings, high-grip banks, slippery off-camber corners and sharp curbs -- all making the perfect set-up elusive. "Thanks to the OMSE team for the hard work getting our Fiesta STs to the line, said Foust. "We spend a lot of time racing hard in a European championship weekend so just having a car survive to the end is amazing. Having a clean one is almost a miracle." Foust is running an ambitious international rallycross campaign in 2013 that includes select European rounds, international X Games rallycross events and the Global Rallycross Championship. He won the opening event of the European Rallycross Championship in April, at the Lydden Hill Circuit in the United Kingdom. He was one of several race favorites to be crashed out of the first international X Games rallycross competition in Brazil later that month in a first-corner tangle. A year after making his overseas debut in the sport in 2010 with a select campaign, Foust became the first American driver to win a round of the European Rallycross Championship and finished both 2011 and 2012 ranked in the top three. The sport was first introduced to the United States in 2010, and Foust has won both domestic championships since then. Foust said he enjoyed racing this weekend with fellow American Brian Deegan, who finished 13th in his European rallycross debut. The two compete together for Ford on the Global Rallycross Championship. "Brian flat-out had some tough luck but he also gained a huge amount of experience in these cars," said Foust. "Heading into X Games with some momentum is a good thing and it's a solid warm-up for both of us for the races in Munich at the end of the month." Foust will next compete in the Rockstar Energy Drink Ford Fiesta ST in X Games rallycross in Munich, Germany, at the end of June. Before that, he will return to the United States to continue filming the fourth season of Top gear USA, and the second season of Ford's Octane Academy.